We sell a range of secretory signal peptide plasmids that allow the export of a protein from the cytosol into the secretory pathway. Proteins can exhibit differential levels of successful secrection and often certain signal peptides can cause lower or higher levels when partnered with specific proteins. For this reason we sell 10 signal peptides for secretion in mammalian cells, 10 for secretion in bacterial cells and 6 for secretion from yeast cells. This provides a range of plasmid options to enable the successful secretion of your proteins. SnapFusion cloning (amplify your gene to add either BsgI or BseRI at each end and clone in a single seamless step. See the cloning section of each product page for more information and help with primer design. Gibson assembly - create small arms of homology to the plasmid and clone in your gene in a single step. SnapFusion is a method that we developed that allows you to insert your gene sequence next to a peptide tag without adding any extra bases to your gene. 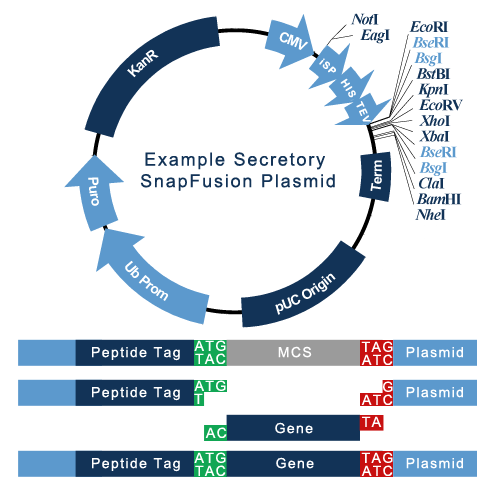 N-terminal Peptide Tags - Using SnapFusion on any of our N-terminal peptide tag plasmids leaves a TG overhang in an ATG start codon that is always poistioned immediately after the peptide tag sequence in our plasmids. It also leaves a TA overhang on a TAG codon that is further down the multiple cloning site. This is achieved by cutting the plasmid with either BseRI or BsgI. To insert your gene amplify it to add any of the followning sites: AcuI, BpmI, BpuEI, BseRI, BsgI, EciI. Then simply cut your gene and clone it into the plasmid. If using BsgI or BseRI you can simply mix the PCR product and the plasmid and add the enzyme and ligase. The gene will automatically be inserted into the plasmid and cannot be cut back out. T4 DNA ligase is active in the recommended buffers for BseRI and BsgI. In eukaryotes the signal peptide is a hydrophobic string of amino acids that is recognised by the Signal recognition particle (SRP) in the cytosol of eukaryotic cells. After the signal peptide is produced from a mRNA-ribosome complex, the SRP binds the peptide and stops protein translation. The SRP then shuttles the mRNA/ribosome complex to the rough endoplasmic reticulum where the protein is translated into the lumen of the endoplasmic reticulum. The signal peptide is then cleaved off the protein to produce either a soluble, or membrane tagged (if a transmembrane region is also present), protein in the endoplasmic reticulum. Signal peptides contain the sequences that are responsible for their own cleavage. This cleavage point will be highlighted in each individual product data sheet. In prokaryotes, the most commonly used secretory tags are the OmpA and PelB secretion tags. These signals peptide function similarly to their eukaryotic counterpart, however, because prokaryotes have no internal membranous organelles, and bacteria have either a cell wall (gram-positive) or a second membrane and a cell wall (gram-negative), the protein is normally secreted into the periplasmic space rather than the supernatant. Please browse our reporter constructs using the buttons below. All of our constructs are designed for broad compatibility and versatile cloning, allowing you easily to produce any derivates you require. As ever, if you prefer to outsource the cloning work, we are happy to undertake it rapidly and efficiently. Please use the 'Build Your Own Secretory Peptide Plasmid' button below to evaluate possible modifications to your chosen plasmids.